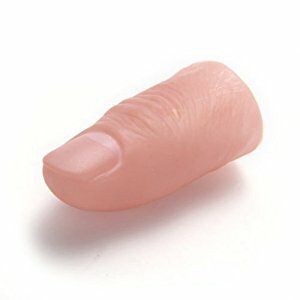 A thumb tip is a magician's prop used for vanishing, producing, or switching small objects. A classic effect is to have a silk handkerchief or other small object pressed into the top of the left fist. After pushing it well in with the right thumb, the left fist is opened to show the silk has disappeared. Alternatively, a lit cigarette, liquid, salt or other small objects can be made to disappear in a like manner.